Nic Collins, der jüngste Großvater des Glitch, umspielt seine zerfurchten CDs mit den zarten Klängen der Hawaii Gitarre und – wie man hört – wahrscheinlich auch mit dem weniger zarten Klang des Feedbacks. Ed Osborn widmet sich den zu Unrecht saisonal vernachlässigten Skiern. Matthew Ostrowski benutzt ganz einfach ganz viele Klänge ganz gleichzeitig. Mark Trayle erinnert an die akustischen Qualitäten des vom Aussterben bedrohten, guten, alten Münzgeldes und wandelt die Kredit-Karten des generösen Publikums zur Sound-Matrix. Und Scott Wilson, der als Kanadier zurecht den Titel der Veranstaltung unterwandert, beantwortet die Frage, ob wirklich alle Daten gelöscht worden sind, mit einem definitiven „Nein!“ und verarbeitet diverse Festplattenfunde zu „Müll Musik“. Violently hacked CDs from the grandfather of glitch, Hawaian guitar, probably some feedback. New York born and raised, Nic Collins studied composition with Alvin Lucier at Wesleyan University, worked for many years with David Tudor, and has collaborated with numerous soloist and ensembles around the world. From 1992-95 he was Visiting Artistic Director of Stichting STEIM (Amsterdam), and in 1996-97 a DAAD composer-in-residence in Berlin. Since 1997 he has been editor in-chief of the Leonardo Music Journal. In September, 1999, he joined the faculty of the School of the Art Instituteof Chicago. His most recent recordings are available on PlateLunch and Periplum. Ed Osborn will present several pieces for using custom instruments made from skis, primitive tape recorders, and assorted electronics. In Language Master, he uses an old language instruction device which functions as an analog sampler that records and plays back snippets of audio from cards that have recording tape embossed onto them. The speed of the cards as they run through the machine can be manipulated as they move, resulting in an analog tape counterpoint to the scratching techniques of record DJs. 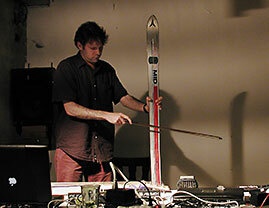 Osborn has developed the electric ski – a ski wired for sound – and is a founding member of the Ski-A-Delics, the worlds first and last all-ski musical ensemble. He will present new work for the ski and live electronics. Also included in the program is a new work for laptop slide guitar and electronics in which the guitar is used both as an instrument and a controller to process its own output. 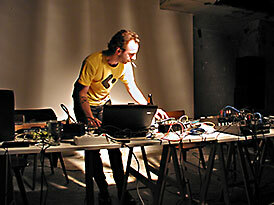 Ed Osborn is a California-based sound artist, composer, educator, and sound designer who has performed, exhibited, lectured, and held residencies in the United States, Canada, Europe, Australia, and South America. His pieces take many forms including installation, sculpture, radio, video, performance, and public projects. Osborn’s work demonstrates a visceral sense of space, aurality, and motion combined with a precise economy of materials that is by turns playful and oblique, engaging and enigmatic. He is currently a guest of the DAAD in their Artists-in-Berlin program. 1-Regoniff – part of the Very Large Numbers series. Music for laptop computer and a lot of sounds at the same time. 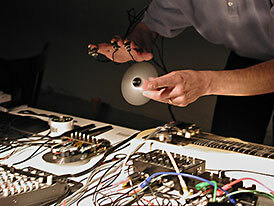 Mark Trayle performs new pieces for live electronics with credit card readers and musical saw. Apital magneti explores the musical possibilities of the credit card. Each magnetic card, like its owner, is unique. In „apital magneti“ the data encoded on magnetic stripes is treated as a kind of musical DNA. Each time a card is swiped this genetic material is captured and parsed to form the rhythmic, melodic, and timbral elements of a musical micro-composition. These micro-compositions form a simulated economy/ecology where they can compete, cooperate, evolve and mutate. Audience members will be asked to lend me their credit cards or bank cards just prior to the performance, to produce a version of the piece unique to a particular audience. Using the card reader as a performance interface, I’ll explore a form of card swiping more „virtuosic“ than the typical consumer transaction. Periodic and Ciprocal are noisy and unpredictable musics made from webs of digital circuits. Very high frequency oscillators, very low frequency oscillators, latches and pulse dividers are interconnected in a network that can be guided but never controlled. Sawhorse (Glider) is a piece for electronics and musical saw. The saw is used both as a performance interface and as an integral part of the electronic circuit through the use of transducers. Mark Trayle’s music originates from the interactions of people and computers. 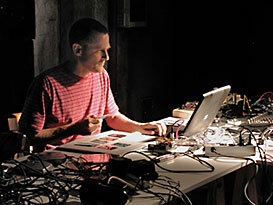 In his work with the pioneering computer network band, The Hub, in his recent piece for wandering quartet,True North, in improvisational contexts or in his solo work for live electronics, the idea is always to make networks of people and computers and let the emergent behavior of those networks form the music. An electroacoustic music piece derived from discarded and recycled data. Types of material used include: News audio from CNN.com (election coverage, commentary etc. ); audio files found in the trash on various computers, or abandoned on a server; any computer file (i.e. Word documents, applications, etc.) given an audio header and played as a soundfile (e.g. a section based upon „playing“ the Windows kernel, which some would argue is „Müll“ as well); donations from composers and soundartists of unused material; combinations of the above. One section is based on a literal interpretation of Kevin Austin1s term Photoshop Music i.e. using Photoshop as a sound processor by altering images which are then played as audio, or converting audio to images for processing with PS plug-ins. In performance the piece plays at revealing the hidden sources of the sounds. This „secret“ content makes itself known at different moments in the piece.